Sabato Battista appears in Painesville in 1918. He does not appear in the 1910 or 1920 Federal Census as living in Painesville. In America, Sabato was known as Saturday Battista. 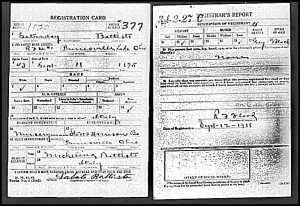 Sabato registered for the military draft for World War One on September 12, 1918, living at Painesville Township, Lake County, Ohio. He was employed by the Storrs and Harrison Company. Sabata Battista was born on September 18, 1875, at Casalciprano, Italy. Sabato first immigrated, to the United States before 1908. He re-enters the United States on April 10, 1911, travelling to Utica, New York. He lived in Niagara Falls, New York, from 1908 to 1909. How Luigi is related other Painesville Italian Battista’s (all from Casalciprano), Donato Battista, Francesco Battista, Giuseppe Antonio Battista, Lucia Battista, Maria Giuseppa, Nunzio Battista, Pasquale Battista, or Luigi Battista is not known.